An Italian breath of fresh air in the luxury sedan segment, the 2019 Alfa Romeo Giulia possesses an elegant style, track-tuned engine options, handcrafted Italian luxury amenities and innovative tech that promise to make it stand out from its German-manufactured rivals. 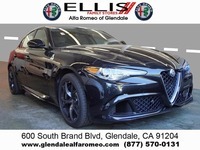 With a world-class design and the performance to match, the Alfa Romeo Giulia is a fan favorite at Alfa Romeo of Glendale and the track-ready 2019 Alfa Romeo Giulia Quadrifoglio grade in Glendale, CA resides at the top of the lineup. Armed with a bold, four-door compact sedan platform, the 2019 Alfa Romeo Giulia is available in six grades – Giulia, Giulia Sport, Ti, Ti Sport, Ti Lusso and the high-performance Quadrifoglio – that can be tailored to fit your lifestyle. Alfa Romeo Giulia entries provide drivers with room for five passengers in a lavish cabin that adds 12 cubic feet of cargo space. The Alfa Romeo Giulia lineup starts at $38,295 and the performance-tuned Alfa Romeo Giulia Quadrifoglio comes in at $73,995. What Are the 2019 Alfa Romeo Giulia Quadrifoglio Engine Specs and Features? Power and performance are at the heart of the track-inspired 2019 Alfa Romeo Giulia Quadrifoglio in Glendale, CA. With a price tag that starts at $73,995, the Alfa Romeo Giulia Quadrifoglio promises heart-pounding thrills at every turn that are complemented by opulent interior amenities and world-class technology and innovations that will upgrade your day-to-day drive. Alfa Romeo Giulia Quadrifoglio entries are powered by a Ferrari-tuned 505-horsepower 2.9-liter turbocharged V-6 power core that will manufacture 443 pound-feet of torque that is directed to the rear wheels. Married to a responsive eight-speed automatic transmission, the Giulia Quadrifoglio will sprint from zero to 60 mph in just 3.8 seconds and will achieve a heart-pounding top speed of 191 mph. Dedicated to award-winning performance, the Alfa Romeo Giulia will add carbon ceramic Brembo® brakes, a torque-vectoring rear differential that will transfer torque to the individual rear wheels, a dual-mode exhaust system, carbon fiber aerodynamic design elements, 19-inch wheels, Pirelli high-performance tires and an adaptive suspension system. Italian craftsmanship and luxury are hallmarks of the 2019 Alfa Romeo Giulia Quadrifoglio design template that will endear the automotive masterpiece to drivers. An 8.8-inch infotainment system with a rotary controller resides at the heart of the Alfa Romeo Giulia Quadrifoglio cockpit and provides one-touch access to Apple CarPlay, Android Auto and Bluetooth. Premium Italian leather is a highlight of the Giulia Quadrifoglio cabin and is offset by carbon fiber trim to create a modern feel. Additional highlights of the Alfa Romeo Giulia Quadrifoglio spec sheet include a 14-speaker Harman Kardon® sound system, integrated navigation, aluminum steering wheel-mounted paddle shifters and an Alfa DNA Pro Drive Mode selector. 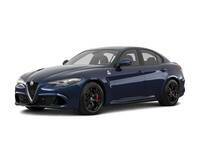 Visit Alfa Romeo of Glendale today to get behind the wheel of the track-ready 2019 Alfa Romeo Giulia Quadrifoglio! Interested in an Alfa Romeo Giulia Quadrifoglio?